Have you tried socca yet? Because I'm about to sound very starry-eyed and naive about it, which might bore the connoisseur. If you haven't, think about it. It is SO easy and SO awesome. SO much so, I've been repeating myself about it all week since first trying (for the first two times--Thai-inspired version coming up next), yet it's taken me awhile to begin recording the recipes. I wanted time give them the kind of introduction socca deserves. I'd been wanting to try socca for awhile since I came across this Mark Bittman recipe. A traditional dish from Nice, socca is essentially a chickpea pancake, but also so much more. It's naturally gluten-free and vegan, and oh so versatile and easy to both prepare and get creative with. One cup of chickpea flour will fill a good-sized skillet...10-inch, 12-inch, 8-inch; the different thicknesses and levels of crispiness all seem to work. And I love how chickpea flour is relatively inexpensive and accessible, as gluten-free flours go. Socca delights me with a bounty of seeming contradictions that work. While there are infinite ways to vary in presentation and preparation of the overall dish, the basic recipe for the socca itself is pretty constant. Socca provides the comfort of the familiar with a uniqueness that elevates it in all its forms, at least to newbie me. Go crispy and cut up for an appetizer. Bake a little thicker for an oven pancake that is lovably fuss-free, both in the cooking and the flexibility with toppings. Sweet or savory sumptuousness. Fold it or roll it. Put under the broiled for a pizza crust alternative that has just enough crispness for a good hand-held wedge and retains a nice soft chewiness, too. Throw in herbs, chopped olives, onions, spice. It's a winner any way. In a large bowl, sift chickpea flour, salt, and pepper. Whisk in warm water and olive oil. Let sit, covered, for 30 minutes to 8 hours. 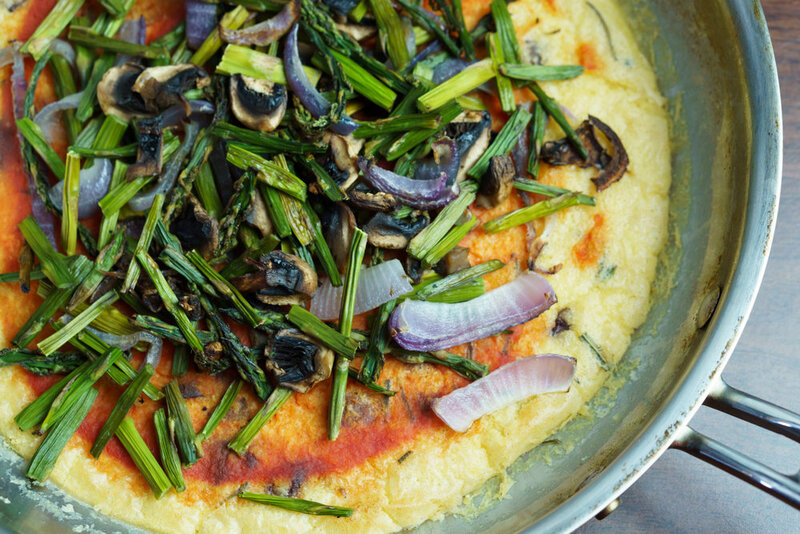 While batter is resting, combine asparagus, mushrooms and onion on a baking sheet or roasting pan. Sprinkle with salt and fresh ground pepper to taste and toss with olive oil or coat with cooking spray. Cook until asparagus is tender, approximately 15 minutes. Remove from oven and set aside. Preheat the broiler with a rack positioned 8 inches from heat. Liberally spray a 10-inch (approximate) ovenproof skillet with cooking spray and place in the oven to preheat. Using an oven mitt/potholder, pour batter in the skillet and return to the broiler. Cook approximately 8 minutes, until the socca is set and the edges are browning and pulling away from the sides of the pan. Remove from oven, turn off broiler and turn oven to 425 degrees Fahrenheit. Use a spatula to evenly spread tomato sauce over socca. Top with roasted asparagus mixture. Return the skillet to the oven and bake a further 5 minutes, or until socca is becoming crisp on the edges and toppings are heated through. Thai-inspired roasted pepper socca "pizza"